My birthday is coming up, so I made myself a birthday shirt. 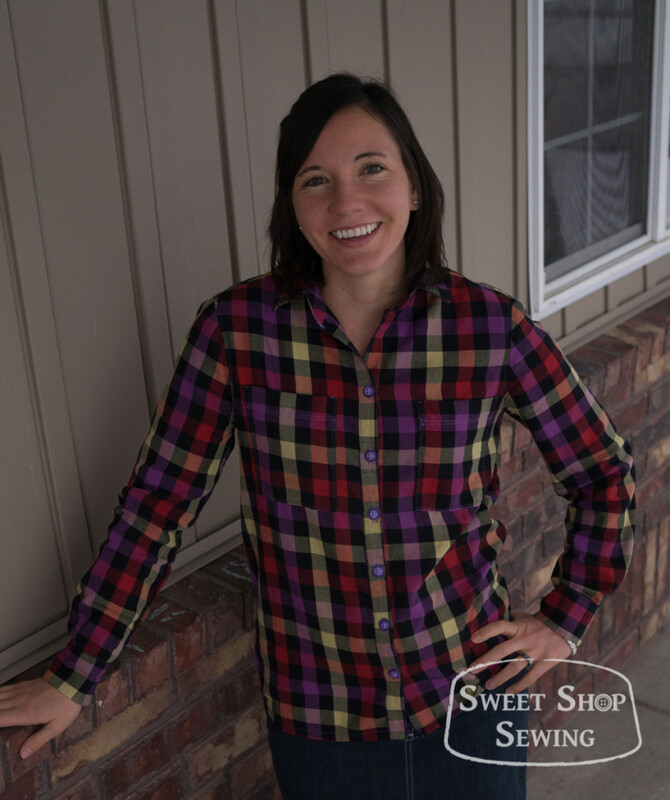 Hey-before I sewed I used to buy clothes for my birthday, but now it’s a lot more fun to make ’em! To make my shirt I used the Archer pattern by Grainline Studio. I saw this pattern awhile ago and I couldn’t decide if it was something I’d really like or not because I mostly stick to wearing knit tops. But then I saw a few versions on other blogs (like this and this) that looked super cute so I decided to make one. 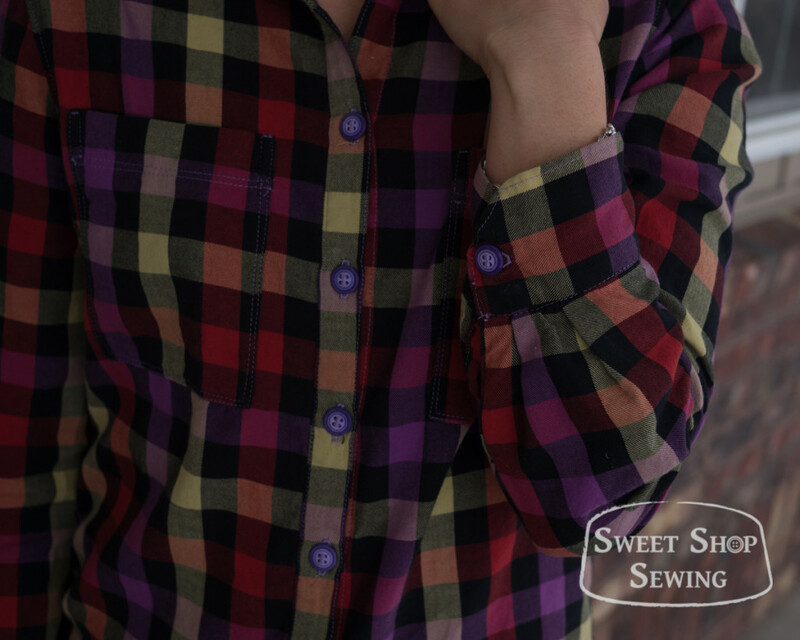 I used some lightweight cotton twill shirting from Mood Fabrics (This is my favorite fabric store right now!) for this and I really like how it looks and feels. The only problem was that the fabric was so shifty that when I cut my yoke on the fold, I didn’t realize that the fabric underneath had shifted. You can see that because of this the checks are off at the bottom of the yoke. 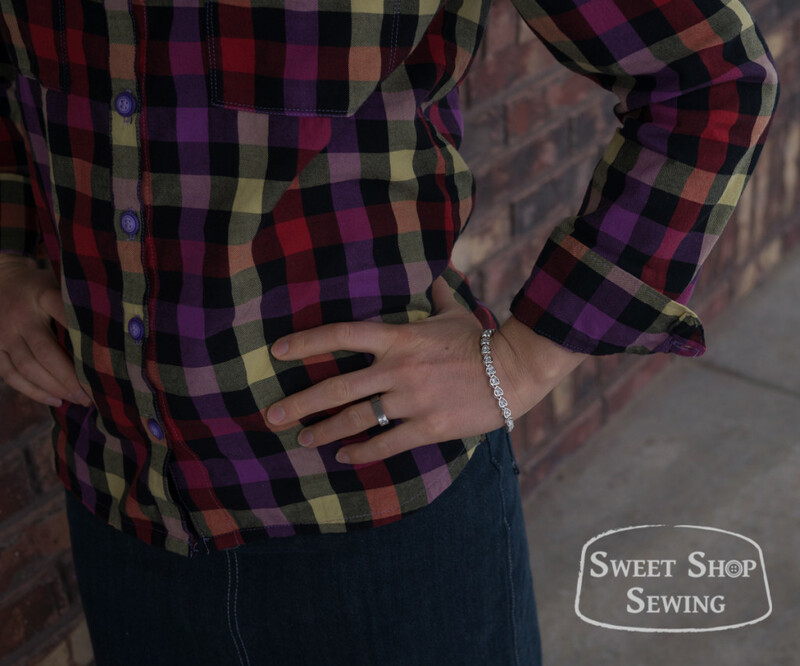 But I barely had enough fabric to make this shirt so I couldn’t cut new yoke pieces. I don’t mind too much though. I had to make two muslins for this shirt. For the first muslin, I went with my bust size (size 2). But that didn’t work because although it fit really well through the bust, torso, and lower back, it was too tight across the shoulders and through the biceps. I could have just altered that size to have more room in the shoulders and biceps, but I thought it might end up being easier to just go up a size. I dropped the armpits by 1/4″ (I am wide through the shoulders and bicep area!). I added just a touch more width through the bicep area. That was easy to do because the pattern narrowed a little bit through the bicep and then widened back out at the elbow-I just kept it wider to meet the elbow. I added about an inch to the length. I also evened the hem out a bit so it wasn’t as drastic of a shirttail hem. I only had 8 matching purple buttons, so I decided to leave the button off of the collar stand. I was never going to use that button anyway. I also moved all the buttons down a little bit on the front. 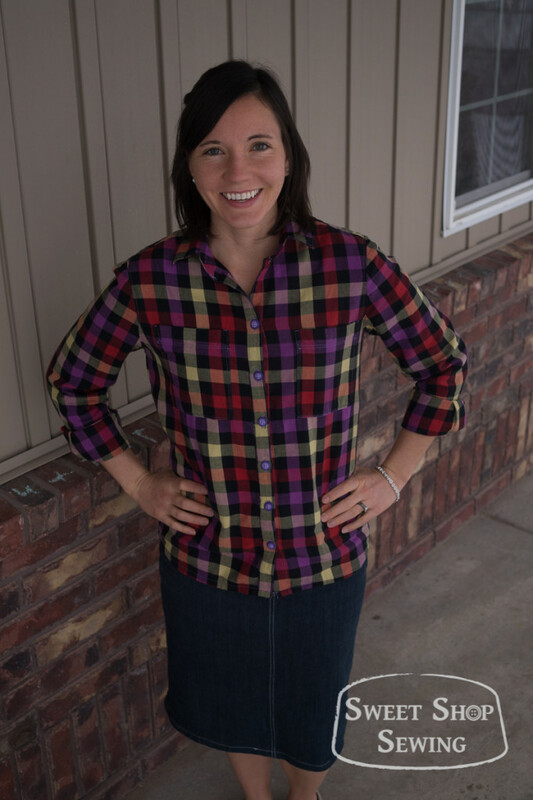 I felt like that top button after the collar stand was too high, but the second button down was going to be too low so I just shot for in the middle of that and then split the difference of how far down I moved the top button between the other buttons. That probably made no sense at all, but it did work for what I wanted. I have made several button up shirts for Jon and my boys, but this is the first long sleeved one I’ve made with a sleeve placket and cuff. 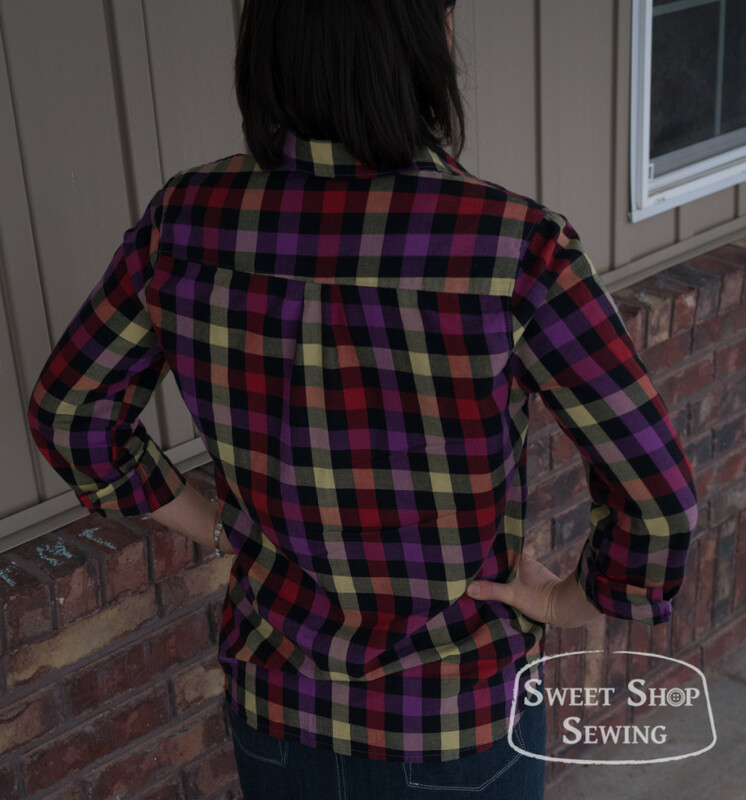 I learn so much better from watching someone do something rather than trying to look at a diagram or read instructions, so I was glad to have my Craftsy class called The Classic Tailored Shirt to help me see how to do the plackets and cuffs. This shirt seriously took me like 15 hours to make! That’s including putting the pattern together and making the muslins and stuff, so next time will be a lot quicker. But I like the shirt and I’m feeling happy that I finished it. P.S. 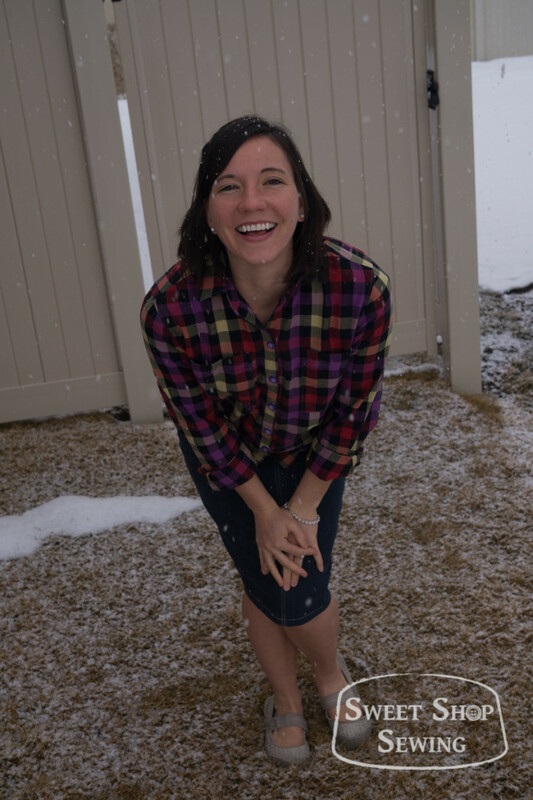 It was snowing when we took these pictures and Jon told me I should come down in the snow for a couple because the snowflakes were so pretty. Why not? 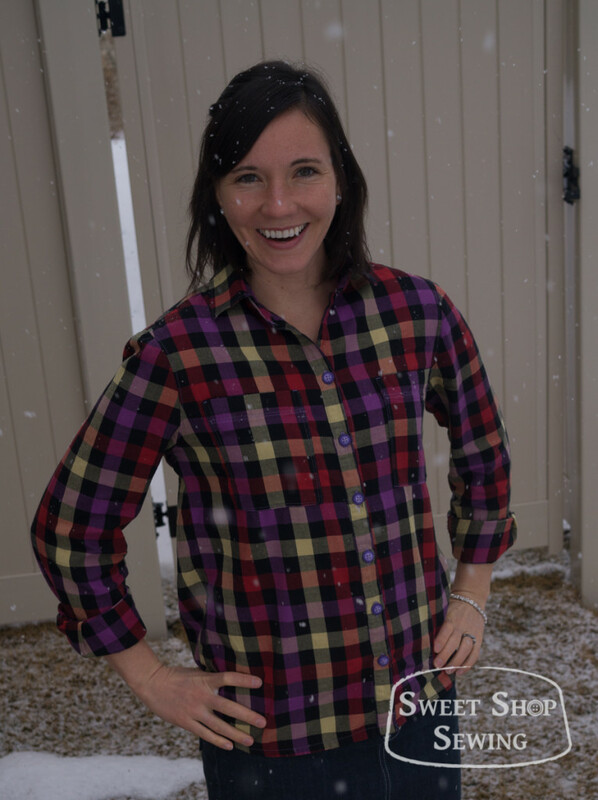 This entry was posted in Sewing and tagged Archer, Craftsy Classes, My Clothes on January 12, 2015 by Bryanna. Oh my gosh you are so cute!! I love looking at your cute face because it just makes me happy 🙂 I love this shirt! It is so cool. 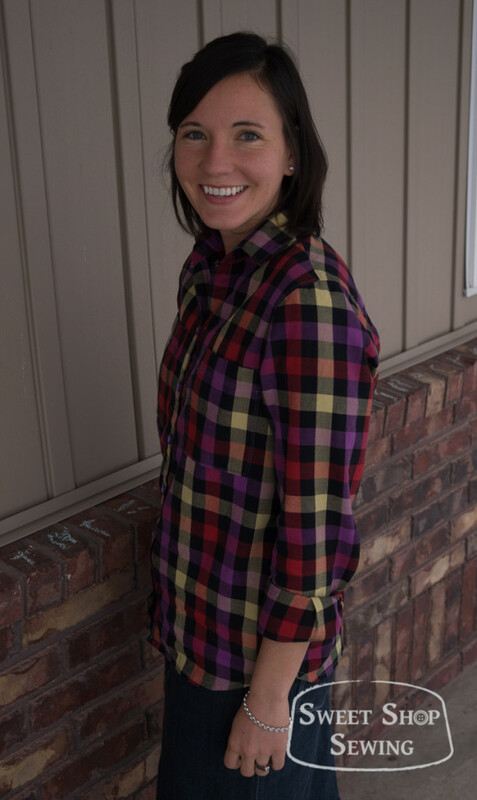 I love the colors and I love how you can always customize your clothes to fit you perfectly. I think that was such a nice touch to leave the top button off because I NEVER use that one either. Just altogether a wonderful pattern and fit for sure 🙂 Totally worth those 15 hours, lol. Happy birthday! 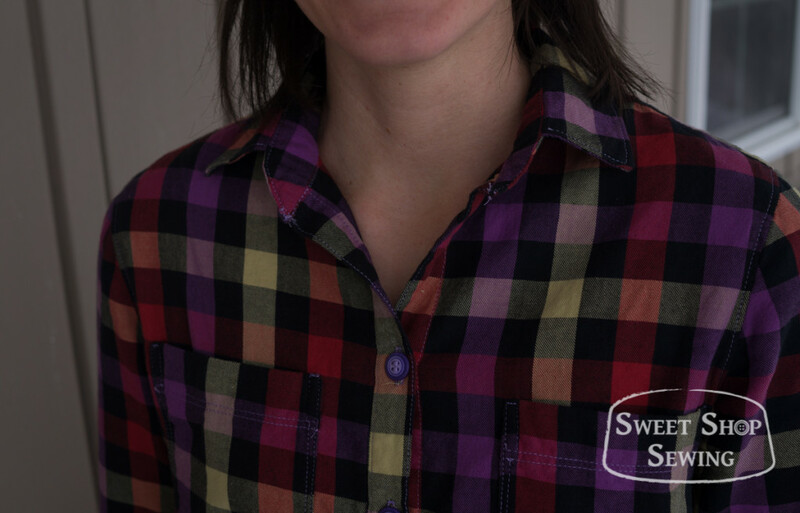 Very cute shirt–the purple buttons really make it. It’s great! Very practical but cute too. Your post is comprehensive – thank you for sharing the details of the alterations that you made. Super helpful! Archer is my favorite shirt patterns! I made four of them for myself. I had a same experience with buttons, where I only had a limited number and skipped the one on collar!